As Lowell Historical Society curator Ryan Owen continues to guide us through the Society’s collection, making things orderly, noting his finds and preparing for new donations, he offers this treasure from the archive – the wooden stake. Of course there’s a story! During these last few weeks, we’ve been busy at the Lowell Historical Society. As we near the end of our 2013-2014 year, we had our annual meeting last weekend at Lowell’s Pollard Memorial Library where our society’s Vice President Kim Zunino spoke about some of the fascinating finds she’s encountered in the attic of Lowell’s City Hall. With our new year, we are also welcoming a new member, Kathleen Ralls, to our board. And, last, but never least, we continue to work feverishly on integrating new collections and artifacts into our archive. Look for more on that soon! At first glance, it looks like an old wooden stake, rounded, with some fire damage evident at its edges. The stake looks old, feels old, but still retains just a hint of a smoky, burnt wood sort of odor. But, before you ask. . . No, it’s not one of the last surviving wooden stakes left over from the Victorian vampire epidemic rumored to have hit Lowell in the 1890s. 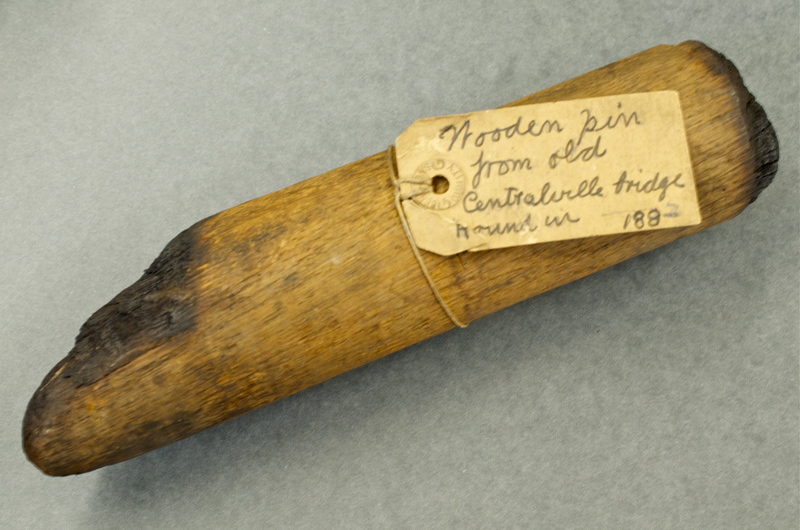 It’s actually a wooden pin retrieved from the ruins of a fire that ravaged Lowell’s Central Bridge on August 5, 1882. 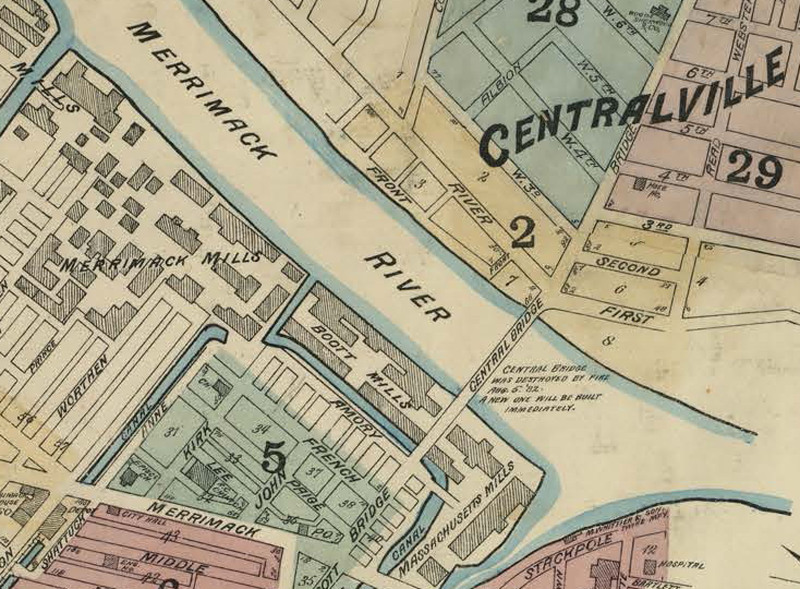 Although largely forgotten today, the fire caused quite a stir in Lowell back in those days. Much better known today as the Bridge Street Bridge, the span connecting Lowell’s Centralville section with its downtown mainly goes unnoticed these days, except for the occasional traffic jam which gets it into the news. These days, when the cars begin to back up, you can drive your car along the river for a couple of extra minutes, and cross the Merrimack River at the Aiken Street Bridge, or at the Hunts Falls Bridge. But, when the Central Bridge burnt down on that August night 130 years ago, folks who found themselves on its Dracut side had a real worry. How were they going to get to work? 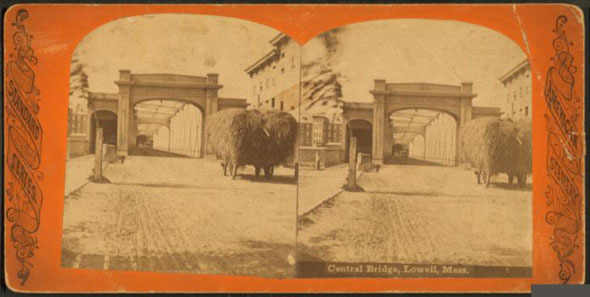 In a time before vacation days, workers who walked the Central Bridge to earn their bread in Lowell’s mills watched in disbelief as flame consumed the bridge in 1882. The first of them noticed the fire in the quiet of a summer night, just a few hours before sunrise when the first flames were seen at the south end of the Central bridge, the section closest to downtown. When he saw the flames, he ran and told the nearest policeman, who ran to the nearest fire alarm. The fire brigade came soon after, but their progress wasn’t fast enough to prevent the spread of the fire beneath the bridge. As they made their valiant efforts to put down the fire on top of the bridge, the flames spread nearly half its length underneath. The men slung the fire hoses across the bridge, and also battled the flames from the nearby Boott mill. Another hose carriage fought the flames from the Centralville side. The fire kept advancing, though, and just an hour later, flames were engulfing the entire span of the bridge, and lighting up the night sky. From the downtown end of the bridge, the firemen made one last push to save the structure, climbing into the burning bridge, and trying to put down the fire. They fought until the end, until the bridge itself failed and fell into the river below, throwing five firemen into the dark waters with it. A sixth man, Capt. Cunningham, who had been fighting the flames from the roof of the bridge, caught onto the cross bar of a telephone pole as he fell and clung to it until he was rescued. All of the men survived, but several sustained injuries. As the bridge failed, spectators on both sides of the bridge watched a gas pipe explode in a blinding flash as firemen called out to their brethren in the dark waters below. They feared for the men flailing about in the water. They also feared that the Boott or the Massachusetts mills would be next. They shuddered as their watched the windows of the Boott mills smolder, and then ignite. During the fire, and the days and weeks following, all speculated on what might have caused it. The going theory was that it had been caused by the sparks thrown off by some machinery used by the Boott mills. Some even came forward to say that they had seen the bridge catch fire a few days before, and that workmen from the mill had put it out. In the end, though, it didn’t matter. The bridge was a total loss, leaving more than 8,000 Centralville residents cut off from Downtown Lowell and their livelihood. Those with horses, the wealthier in Centralville, were able to go a few minutes out of their way and enter the city by the Pawtucket bridge, but most of the people who depended on the bridge walked to work. And they were out of luck. The only way left across the river appeared to be by boat, which harkened back to the days of Bradley’s Ferry, before the bridge was built. In the days following the fire, the City Council discussed and approved plans to lay a footbridge across the ruined bridge’s span. It was quickly put into place, and Centralville residents were thankful – even if it didn’t have a cover, which drew a little bit of ire among Centralville residents. By March of the following year, townspeople were known to remark that the builders of the old bridge knew what they were doing when they made it a covered bridge. The relics of the old bridge quickly became popular. A January 1883 Lowell Sun article recounted how City Marshal McDonald was presented a ‘finely finished white oak club’ made from the timbers of the old bridge, which had been under water for 54 years. The novelty of the ruined bridge wore off quickly, though. Lowellians grew impatient with the builders as the months following the fire wore on. By September 1883 a Lowell Sun writer stated that ‘whoever drew up the contract between the bridge company and the city of Lowell for the bridge’s iron work ought to create a new one, and then tie a handkerchief around his eyes and jump into the river.” The writer went on to say that the delays had hurt Centralville residents and city traders, and that the contract offered the city no recourse in addressing the delays in the construction of the bridge with the builders of the bridge. In the end, though, the bridge reopened. It took almost a year, but a new iron bridge reopened in the old wooden bridge’s place. That bridge stood for over half a century, before being washed away in the Flood of 1936, and replaced by the bridge that still stands today. 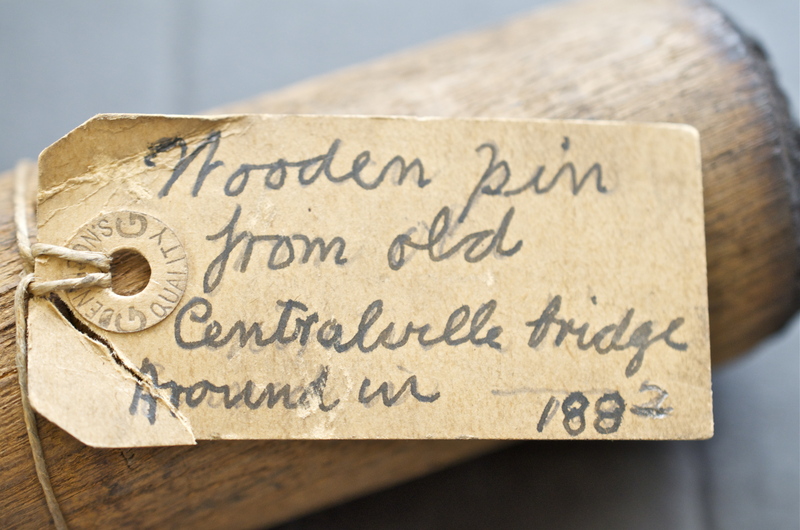 And that’s the story of the wooden pin in our collection, contributed and tagged so long ago. (The tag itself is almost as interesting as the pin itself.) The pin is just one of the items in the collection that we’re currently researching. Watch here for future updates on other items we find in the collection. The Lowell Historical Society’s curator Ryan Owen is on a roll (sorry just had to write that!). His latest collection “forgotten find” is affectionately called “Hi-Hat Man.” Learn about him and the iconic entertainment venue – Lowell’s Hi Hat Rollaway in Ryan’s “Forgotten New England” post. We call him Hi Hat Guy, at the Lowell Historical Society, after the name of roller skating rink that is lettered across his red tie. To the modern eye, Hi Hat Guy looks a little like Phil Dunphy, at least at first glance. 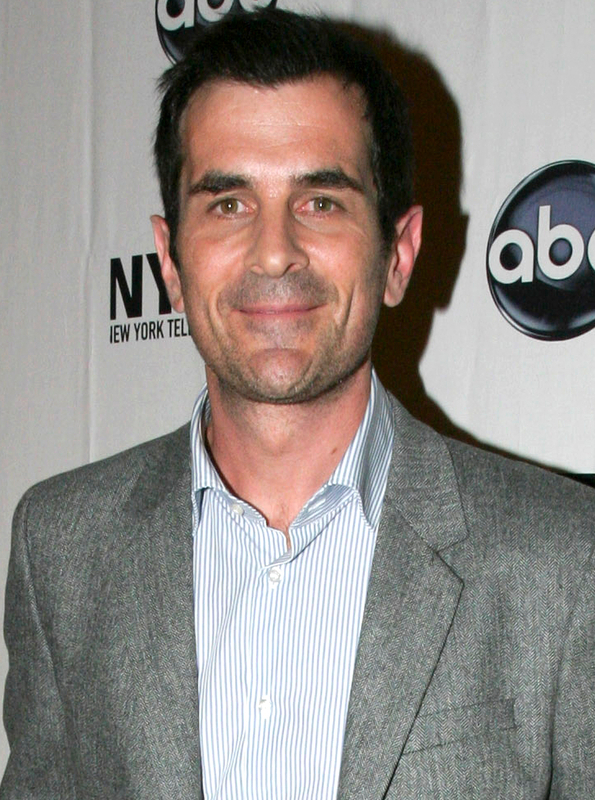 He’s the father figure played by Ty Burrell on ABC’s Modern Family. Hi Hat Guy also looks like a lot of bobble-head dolls – well, except for the fact he’s hand-carved from wood . . . and over 40 years old. Hi Hat Guy has been sort of a mystery. According to our accessioning paperwork, he dates from 1969 and was carved by one W.L. Bemis. He entered our collection in 1994. Unfortunately, his paperwork doesn’t tell us much more, like who he might have been modeled after, or where he might have once been at the Hi Hat. So, we’ve made Hi Hat Guy our next artifact to research. And any research on Hi Hat Guy has to be research into the Hi Hat Rollaway itself. There are few defunct businesses so iconic to Lowell as the Hi Hat. Some close rivals that come to mind are the Bon Marché or Record Lane or maybe even the Giant Store. But, the best chance to get to the real story behind Hi Hat Guy rests with researching the institution he represents. Researching the Hi Hat is a lot like researching the Bon Marché. The Hi Hat has such a long legacy, stretching some six decades. Where would one ever find a wooden bobble-head doll in over 60 years of history? Well, like so many of Lowell’s iconic memories, there’s a Facebook page dedicated to the Hi Hat’s memory. The folks of the Hi Hat Skating Club Facebook page fondly remember the Hi Hat, and have formed a close-knit community dedicated to reminiscing about the Hi Hat, its history, and its many personalities. 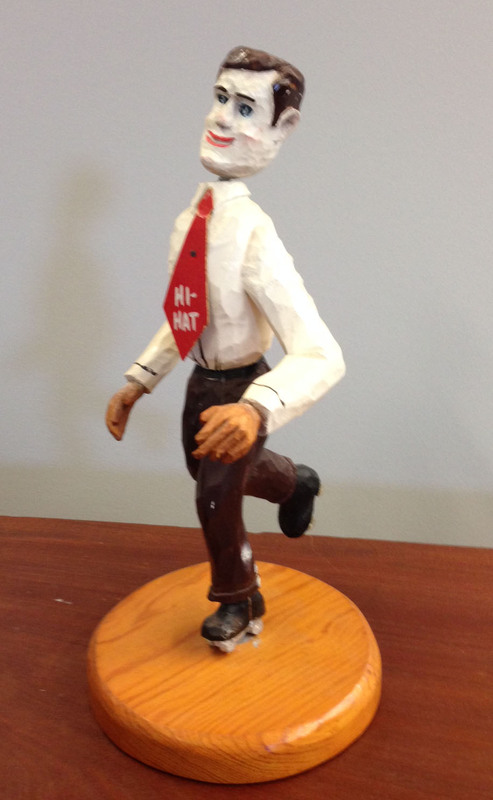 Surely, the story behind our Hi Hat figurine must be captured somewhere in their memories. By 1969, the year Hi Hat Guy was carved, the Hi Hat was owned by Maurice Rochette, or Mo as he is fondly remembered by the Hi Hat skating community on Facebook. 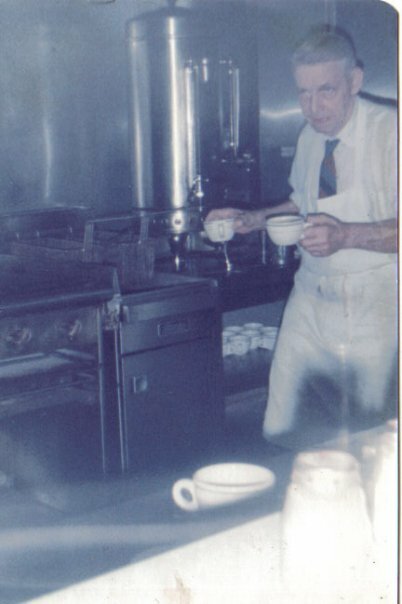 Mo also ran Lowell’s famous Rochette’s diner, and was well-known for the food he prepared. While hired managers oversaw the roller skating rink, Mo made his signature tomato soups, grilled cheese sandwiches, and lemon meringue pies. But the most Facebook chatter surrounds memories of Mo behind his snack bar, serving up his french fries, the gravy, and famous Rochette beans. Mo Rochette was a veteran of the Lowell restaurant scene, going back decades to the WWII years. It seems, at least in his later years, that Mo was hard of hearing. Many fondly recall placing their food order only to see Mo lean closer, cup his ear, and ask them to repeat what they had said. Hi Hat Guy – From the collection of the Lowell Historical Society. Photo by Author. So, we went to the Hi Hat skating club on Facebook to see if they could give us the identity of the wooden bobble-head dating from 1969. And, where the trail had run cold on who he might have represented, or where he might once have stood within the Hi Hat, the digital age of social media actually presented its helpful face, allowing us to solve at least part of the mystery. Not two days after I posted my original question about his identity to the Hi Hat’s Facebook group, we got our answer. The bobble-head, held by the Lowell Historical Society for some 20 years, represented none other than Mo Rochette himself, in his younger years. There are many Hi Hat memories posted to the Facebook group, some of first loves, and others of first kisses shared (or stolen) in the booths at the Hi Hat Rollaway. Today, even though condos occupy the site once held by the Hi Hat, maybe just a little of its memory lives on in the roller-skating figurine carved in the image of Mo Rochette, its last owner. It so easy to drive by the Hi Hat’s former Princeton Boulevard location without even realizing that it once stood there, for six decades. Did you know that the Hi Hat’s history dates all the way back to the days of Prohibition, in the early 1930s? In its long history, not everyone was a fan of the Hi Hat, or viewed its brand of entertainment as light, safe, respectable fun. Even a former Lowell mayor complained that she’d never ‘let her daughters set a foot inside’ and mingle with boys who wore untucked shirts with dungarees, and girls who wore short shorts. That’s a tough question to answer. The Lowell Historical Society has been around for a long time. I’m reminded of this each time I visit our archive. Just this morning, I found a book, one of those old official-looking volumes with the word ‘records’ embossed on its side, that contains minutes from a few decades of our board meetings, starting from 1943. And then, just next to that, was a stack of correspondence with donors from 1973. All of this is impeccably preserved. But the Society’s collection is much older than that. Its history dates back to its founding in 1868. That’s a lot of time to collect odd things, that have since become old. This is exactly the case with our Box of Cinders. 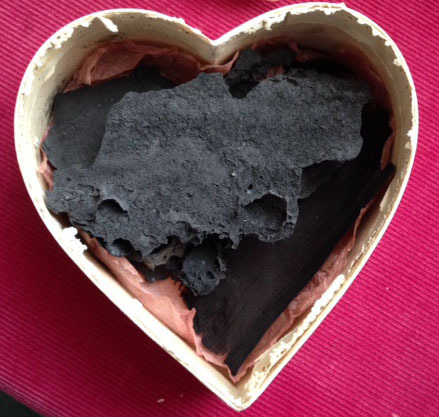 Yes, the cinders, or ashes, are in a heart-shaped box. As we’re currently in mid-February, I suppose that’s sort of seasonally appropriate. The note attached to the top of the box, which probably accompanied the donation some ninety-ish years ago, identifies the remains within the box not as . . . some long-lost loved one, but as what one Charles C. Swan, a retired shoe dealer, found on his lawn one Friday morning on June 4, 1926. The note actually provides a lot of information, which is great. What’s sadly lacking is some explanation as to why the ashes were put, and kept, in a heart-shaped box, for these last 88 years. This informational gap is perhaps one of the greatest tragedies in our collection. Some questions just don’t have a satisfying answer. Most folks, after finding something on their lawn one morning, probably wouldn’t think of donating it to their local historical society, but Charles C. Swan must have been a bit of a visionary. And he was the treasurer of the Lowell Historical Society at the time. So, he understood the significance of historical events when he saw them unfold. Charles C. Swan probably saw the flames consuming Pollard’s Department Store the afternoon before, maybe from his home a mile away, at 452 East Merrimack Street. Or maybe he was downtown as the chaos unfolded late that afternoon. Maybe he saw the firemen arrive, first from the Lowell Fire Department, then from the surrounding towns of Billerica, Chelmsford, and Dracut. Firemen from as far away as Lawrence came to join in the fight to save one of Lowell’s largest department stores. No one died, but several firemen were overcome by the billowing smoke or cut by flying glass. Four hours later, the fire was history. 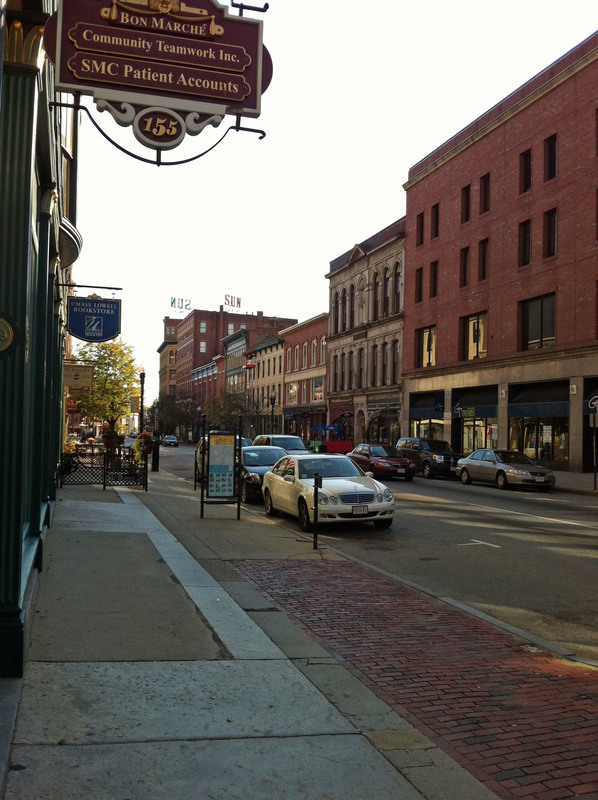 But, so was Pollard’s Department Store, which traced its roots in Lowell to 1836. Only its walls remained. In the eyes of many, including Charles C. Swan, it truly was a Lowell institution, whose loss would be keenly felt. Mr. Swan probably couldn’t imagine Lowell without it. Charles C. Swan must have been overcome at that moment, the next morning, when he found a piece of that history on his lawn. When he picked it up, and held it – maybe even as the smell of the smoke that had consumed Pollard’s still hung in the air. 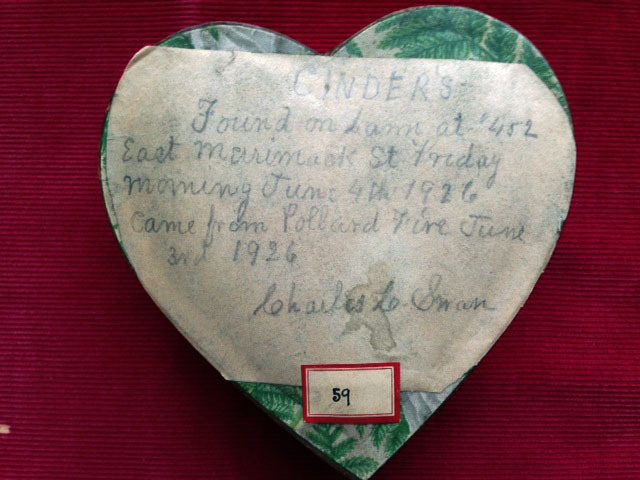 So, he found a box in his home on East Merrimack, the heart-shaped box, and saved that little bit of history for posterity by donating his find to the Lowell Historical Society. And it worked too. Those ashes, which otherwise would have likely blown away in the next spring breeze, or melted into his lawn with the next spring rain, way back in June 1926, are still carefully held and preserved by the Society today. They’ve survived Charles C. Swan, who died a few years later in 1929, and even the great Pollard’s Department Store, which subsequently rebuilt and reopened, but then closed its doors for good in 1969. Sometimes the most fragile relics are those which survive the longest. The Lowell Historical Society is constantly receiving artifacts from people around the country. While it would be an impossible task to share them all out with the world, we like to share a few of our more recent acquisitions. Recently, an 80-year-old woman who moved from Lowell to Vermont in the 1950s sent us a box of newspapers and panoramas. One of them was this George Russell that will celebrate its 100th birthday in a few more years.